Clear the clutter – There’s nothing like looking around your environment (your office, home, car, garage, etc.) and clearing out the clutter – those items I no longer need which not only don’t support me, but are draining me. I find every time I do this, I make room in my life for better things. Close open loops – These are tasks or projects that you just haven’t quite finished up. You know the ones. That pile of clothes you have 1/2 sorted that need to be taken to Goodwill. Your tax information that’s half compiled and sitting in piles on your dining room table. The papers that need to be filed in your office. Make a list of all of your unfinished projects and start completing them, one by one. Remember your year – This one is really important. Sit down with your calendar and go back to January. Now flip through it, week by week, and remember all that you’ve accomplished. Take a second when you hit on a big win and congratulate yourself. If something that wasn’t such a success comes up for you, find a way to forgive yourself (or someone else) and let it go. Dust off your goals – Finally, look at the goals you set at the beginning of this year. If you still have some unfinished business with yourself, think about why you set that particular goal in the first place and if it’s still important to you. If it is, will you carry it forward into 2015 or complete it before the end of the year? Finally, once you’ve worked your way through the above areas, you’ll be ready to create a strong plan for 2016 and begin implementing it as soon as the new year begins. Need a little help with that? Join me TODAY for my “Cracking The January Code for a Wildly Successful Start To Your Direct Sales Year in 2016!” I’m doing 2 webinars…one at 9:00 am PT/12:00 noon ET and one at 5:00 pm PT/8:00 pm ET. If you CLICK HERE you can register and get access to the live webinars or, if you can’t make it, I’ll send you the replay as long as you’re registered. 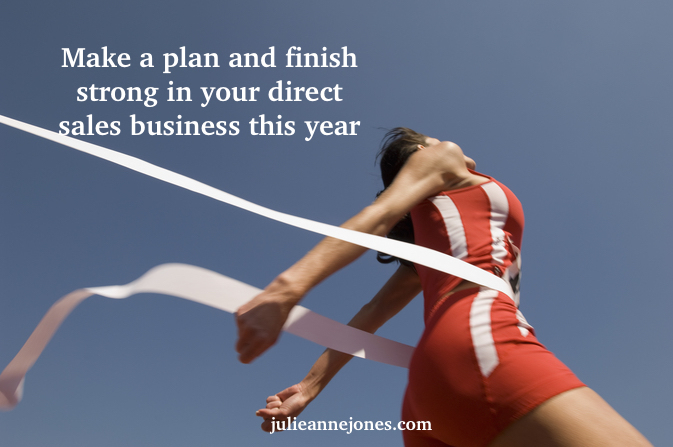 I’m excited about sharing the 3 simple steps I use to make a plan for the new year every year!